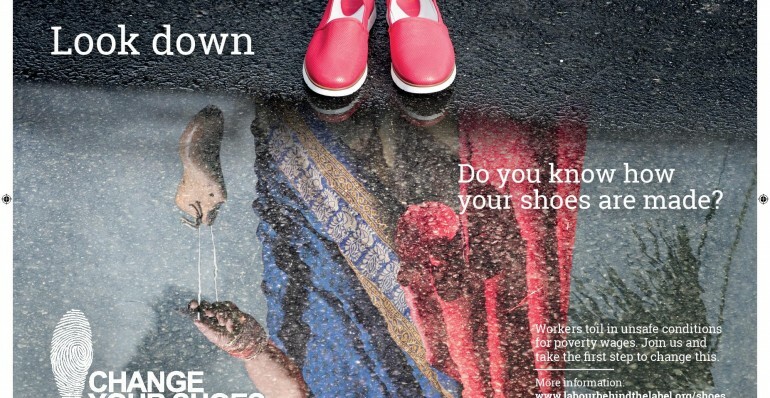 Ahead of shopping for your perfect Christmas party outfit this year, Labour Behind the Label, part of a network of organisation that supports and defends garment workers worldwide, are launching the Change Your Shoes campaign in the UK. Made up of 18 organisations across Europe, Indonesia, India and China, the campaign is calling on the EU for regulations which promote, protect, and respect workers’ rights throughout the supply chain. Specifically, the campaign is calling for shoe workers to be paid a living wage and for companies who sell shoes in the EU to be forced to publish all information on their supply chain, from the factory to shop floor, including the use of toxic chemicals and working conditions. The campaign has launched the Change Your Shoes app, which is free and takes just seconds to download. The app informs you about the shoe industry, sets out the demands for change and allows you to record your steps in support of the petition – donating them for the virtual march to Brussels. This is no cobblers – by downloading the app you will be taking a small step to improving the conditions for shoe workers globally, and making your soles feel better. So what do we know about the shoe industry? Over 24 billion pairs of shoes were made globally in 2014 – that’s more than 3 pairs of shoes per person. The vast majority of shoes are made in Asia (88%), where working conditions frequently pose a serious health threat to employees. The shoe industry is currently opaque and lacks transparency. Systemic human rights abuses pervade shoe making, from poverty pay, long working hours and denial of trade union rights, to significant risks to workers’ health and the environment through harmful chemicals and dyes. The use of hazardous and toxic chemicals in leather products seriously endangers workers, as well as the consumers in Europe. For instance a by-product of leather production, Chromium VI, releases highly toxic carcinogens. 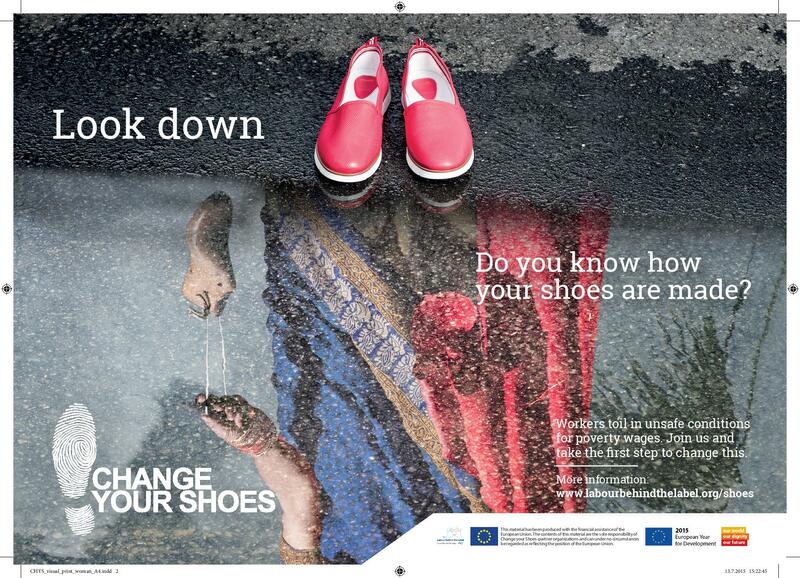 Earlier this year the Change Your Shoes campaign commissioned a European Nielsen survey. This found that 50% of Europeans have little or no information on shoe production. The survey also found that 63% of Europeans believe that the EU should impose regulations on goods entering the European market to ensure workers’ rights are protected. By downloading the Change Your Shoes app when buying your Christmas party gear, and virtually stepping your way to Brussels, you can feel good in your shoes – and not just because they look good. Your support will be a step towards the EU introducing legislation to regulate the industry, protect workers and to inform consumers in an easy way about the conditions under which their shoes were produced and the toxic content they may have. “We all love to buy a pair of killer new shoes for that long-awaited Christmas party, but how many of us actually know anything about where our shoes are made? Few of us are aware that only 2% of the shoes price is paid to the workers who made them, or that many leather tanning poses a serious risk to the workers’ health. “The Change Your Shoes campaign is calling on the EU to make a difference to the lives of the millions of women employed to make our shoes. This step-change in regulation would protect workers, and help inform consumers about the toxins in the shoes they buy. The Change Your Shoes app can be downloaded for free from Google Play or the Apple Store on your smart phone. The app sets out the demands for changes to the shoe industry, and allows you to record your steps and donate them for the virtual march to Brussels – steps will be collected from supporters all over Europe. Labour Behind the Label are hosting a people’s meeting on 12th December at Resource for London. The event marks the last of their activities as part of the EU International Year of Development and will be focused on the EU and workers’ rights.